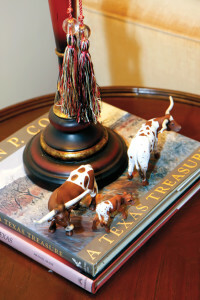 Creating a new vignette for your coffee table is a great seasonal project. You don’t need a huge decorating budget, you can shop your own home, and you can change it out as frequently as your creativity allows—since refreshing it can be as easy as swapping out a few books, adding flowers, or getting a new set of coasters. 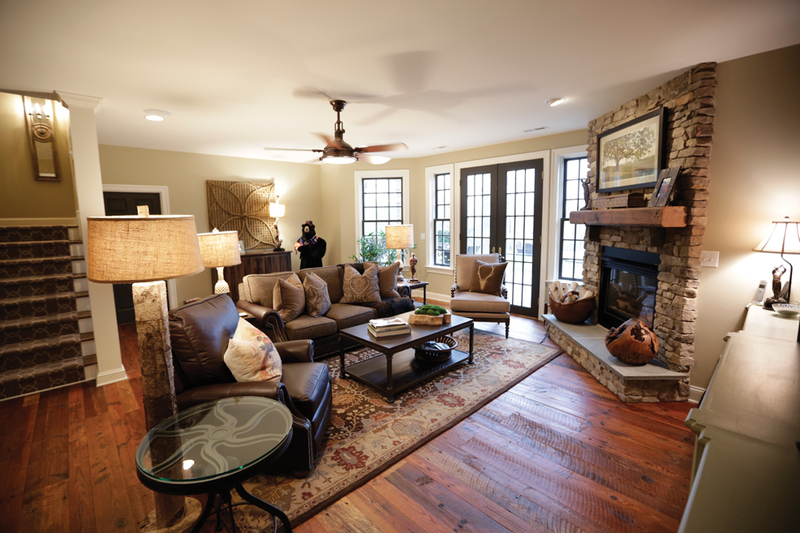 Due to the “up close and personal” proximity of a coffee table, occupants and visitors alike feel compelled to inspect the things they find there, making it the perfect spot to show off keepsakes or a unique collection. Keep your treasures out in the open where everyone can enjoy them and put the “you” into “your home.” So, let’s clear the tables and create a whole new look for your coffee table this spring! The coffee table is the perfect “low-commitment” place to experiment with colors, textures and prints, as nothing placed here is likely to overwhelm the rest of the room. Pull a favorite color from existing furnishings or a piece of artwork and express it on the coffee table through flowers, trays, book jackets or objets d’art. Something as small as a decorative box of matches next to a lovely candle can introduce just the right dash of a bold graphic print or bright pattern to your room. A tablescape is a great place to add an “au courant” tone to your room’s color palette—a trendy hue you might not want large doses of but would love to have as a fashionable accent. For instance, a sleek metallic accessory in antique silver, rose gold or copper would bring a touch of glamor to a tablescape and contrast nicely with the matte surface of a stack antique leather-bound books. 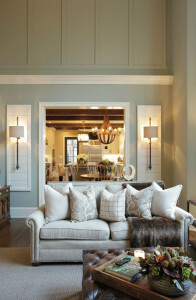 A monochromatic white or ivory color palette is a refreshing look to try for spring and summer. Play up this cohesive look and use it en masse through several kinds of white flowers in a white vase on a white tray (you get the idea). A tray is an excellent anchoring piece, a base layer that keeps everything orderly and compartmentalized. If you use an upholstered ottoman as a coffee table (or even if you don’t), a large tray provides a stable surface for holding books and decorative accessories. Similarly, you can also use stacks of books to display an intriguing object. Setting items on a tray gives them a place to shine, a pedestal upon which to stand. Petite trays, beautiful bowls and small platters are cute catchalls. Long, narrow, slim, square or round—any shape or size can find a place on a tabletop. Shop your own home and think beyond an item’s intended/original use to find a new way to use it in your tablescape. A baby’s porringer could catch the jewelry you cast off at the end of the day, a handmade pottery bowl could hold your husband’s prized collection of keepsake guitar picks, or a small potted plant can rest on a saucer from an antique china set. Create your coffee table vignette the way an artist arranges objects in a still life—by establishing a focal point and arranging other items around it. It’s a familiar suggestion that items displayed in odd numbers (3s, 5s or 7s) are pleasing to the eye. A tall sculpture, vase or flowers will add dimension, but do consider the length of your coffee table and how it relates to the height of those taller objects, so nothing will appear to teeter on top of it. To strike an overall balance for your tablescape, think about the composition of your items. Play with the varying heights and the visual heft of your things (whether they appear heavy or lightweight) to keep your collection of candlesticks from looking spindly, a bunch of boxes from looking chunky, or piles of round things from resembling a group of playground balls. Opposites attract, and it’s fun to pair shiny objects with others with a matte finish. Round with rectangle, big with small, modern with antique. Sneak in a humor book among your art books or display a silly cartoon in a formal silver frame. Cross over into an entirely different style of decor to add a delightful touch of quirk and personality. Just try not to smile when you see that one oddball item in an otherwise very traditional tablescape! Creating balance in your tabletop arrangement is a bit of an experiment—testing the mass and weight of one item and measuring how it works against another. The best way to test it is simply to play. Try a group of things together, take something away and put something else in its place. An item from nature introduces interesting textures to a tablescape. 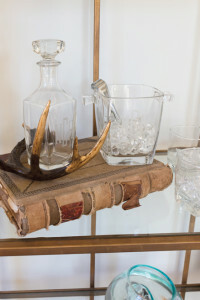 Gathered pinecones, shells and the like, or the smooth horn or mother-of-pearl handle on a magnifying glass all are organic items that conjure up a sense of history. Live plants are slightly sculptural and add “life” to a display. Just be sure to choose plants that favor low light if your coffee table sits some distance away from a window, and place it on a saucer or a plate, to protect the surface of whatever’s underneath it from moisture. A bell jar or a cloche can be used to highlight any special item and elevate it into a piece of art. 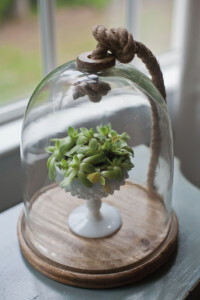 A bell jar is a dome-shaped glass display case/dust cover that comes with a base. The glass dome fits into a groove on the base, creating a seal that prevents air from seeping in or out. Therefore, a bell jar is best used to display inorganic items like Baby’s first pair of shoes, preserved flowers or a figurine. A cloche is similar to a bell jar but doesn’t come with a base. Gardeners use cloches to protect outdoor plants from frost, though indeed they may be used indoors too. Most cloches have a bubbly hand-blown appearance and have a small glass knob on top. Cloches keep humidity up for indoor tropical plants that need it, like orchids and ferns (and they can be used to protect tender leaves from nibbling cats, too!). 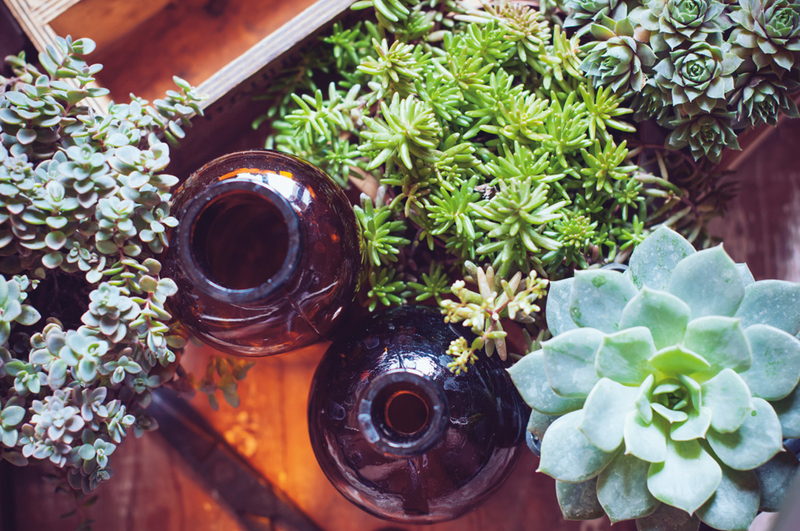 Open-mouthed jars or shallow bowls can be used to grow succulents—dry climate plants that don’t need extra humidity. Consider repurposing a breadbasket, pasta bowl, punchbowl or vintage pie plate for a succulent garden. Lanterns and hurricanes with pillar candles inside can be slightly nautical or very traditional. Your tablescape will look gorgeous when illuminated by the glow of candlelight! Use scented, unscented or even battery-operated candles inside. Or, you could even fill yours with seasonal items like candies or colorful baubles. Finally, don’t forget to put as much thought into what’s under your coffee table as you do what’s on top. If yours is the kind of table that can accommodate a tuck-under, consider stashing poufs, storage baskets, or even a smaller table or stool layered underneath. You can even make tidy stacks of board games or fill baskets with your favorite “keepsake” magazines (like HOME)! Your coffee table has the potential to be so much more than just a coffee mug-resting pad. Design yours to be a knee-high display space that gets everyone talking—a place where you can share your interests and personal style with friends and family through the treasures you’ve chosen to showcase on it.